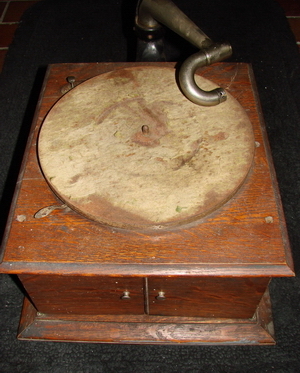 Author’s Victor Victrola IV as it looked when first purchased. The majority of the machine was there, but the dilemma was in the removal of the turntable platter. Ok, so I’ll begin by saying that I’m sometimes a sucker for “basket case” gramophones/phonographs. When I see them in a totally dilapidated state, I think about how relatively easy they are to bring back to their former glory. I enjoy the hunt for missing parts, polishing, restoring and in general bringing the machines back to life. When a ‘talking machine’ is found in a poor state, there is usually no need to consider the “refinish vs. keep it original argument” that often comes up in this hobby. However, when restoring a machine, it is easy to end up spending as much as or more than what it’s worth in the process. This is fine if you’re keeping it for your own personal use, however it is something to keep in mind if you’ll be selling it in the foreseeable future. The best way to keep costs down is to do the work yourself. Besides, there’s always the added satisfaction of knowing that you brought it back to life yourself. The machine in discussion for this article came along last year at one of the CAPS auctions; I ended up purchasing a very sad looking Victrola IV that, at first glance, appeared to have come off the Titantic (AFTER it had lain at the bottom of the ocean for 90 years!). The cabinet was not too bad (scratches and mild water damage), the doors were intact, as was the tone-arm and motor (which had a good spring). Most of the hardware was covered in rust, but that cleans up easily with some SOS pads. The felt material covering the turntable was mostly long gone and replaced with a solid layer of rust. Missing was only the crank and the reproducer. For $55 it seemed like a fair price and had good potential. I was able to obtain a used crank for $25 from one of our members, and now I was able to wind it up. However, the turntable speed was uneven, so it appeared that I would be in for a mainspring degreasing and lubrication. This should always be done anyway for a proper restoration - I’ve been told that the lubricants used in these vintage machines often contained animal fats in the formula. Over the years this grease turns into a hard lump and it’s necessary to remove and replace it with modern wheel-bearing grease. But I had a problem: the machine had obviously spent a considerable amount of time in a damp environment and the turntable was now frozen to the spindle shaft. Rust tightly bonded these two once separate pieces together. Unless I was able to remove the spindle from the turntable, I’d never be able to remove the motor from its board in order to properly overhaul it. How would I address this? For a couple of months I tried putting rust penetrating oil on the spindle where it meets the platter. I’ve had some luck in similar situations before, but not this time. Gentle taps with a hammer and some prying showed that it would not free easily, and something more drastic would be required. I could not merely hammer away at the top of the spindle. First, this would deform the visible pointed top of it, and some further damage could be transposed onto the spindle itself (such as warping it or damaging the hole or tip that it rotated in). One of the many things that I like about going to CAPS meetings is the chance to sit and talk with fellow members about various topics that are phonograph-related. At one such meeting I discussed my situation with one of our club experts, Angelo Raffin. He gave me tips on how best to address this rust-locking problem, which I’m going to share with you here (as well as some of my own observations). 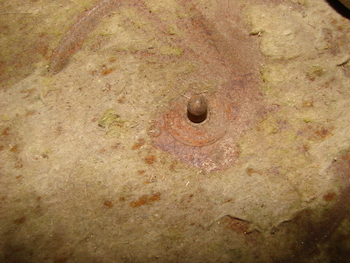 Close-up of the spindle shaft as it was rust-frozen to the turntable platter. Rust-penetrating oil had no effect on it. The Victrola IV was originally designed so as to be able to lift the platter off the spindle in order to get to the three screws that hold the motor board in place (in addition to lubricating the spindle from above). Since this could not be done in the current rusted state, it would be necessary to approach the problem from BELOW the motor board. The IV was Victor’s entry level machine, and is very simplistic in its design. Caution: before doing ANY kind of work on a gramophone motor, you must ensure that the spring is totally wound down. This will help protect you from injury as well as any possible damage to gearing that could be stripped if an even partially wound spring were to suddenly let go. You must let the turntable spin until it stops, then give it a few more rotations to ensure that there is no residual winding or tension in the springs. Once the motor is fully wound down, I proceeded to remove the governor. This is the little spinning assembly that usually has three (or two or four) lead weights on it (refer to photo). The governor’s job is to control the release of the spring’s energy in a gradual manner and, in doing so, is also used to control the turntable speed. You’ll note that the governor is an intermediary device which contacts both the main spring-barrel and the spindle. The governor must be removed so as to fully get to the spindle gear (it is also impossible to remove the spindle with the governor present). Usually the governor is held in place by a small set-screw on each end. The actual manner in which the governor is mounted will vary by manufacturer. Some (such as later Victor motors) will have small indentations in the “eccentric bearings” for the governor, so that it is easy to re-set their exact position. Other brands (especially those made before 1910) will have quite a possible range of travel. If this is the case with yours, then I suggest lightly inscribing or marking the position, so that the governor can later be returned to the same approximate setting. Next, on the bottom of the spindle, you’ll see that there is usually a set-screw that helps hold the spindle into position . Remove that set-screw and slide the pivot assembly out (if so equipped). Note that some brands have a small ball-bearing mounted at the base of the spindle (which helps reduce friction). Be careful not to lose this ball-bearing, as the motor will not run properly without it. With the governor fully removed, you should be able to better see the brass gear that is attached to the top of the spindle (as viewed from the underside of the motor). Rotate the spindle until a small set-screw on the gear is visible. You’ll probably have to clean off the old grease in order to get to it better. Remove the set-screw. I ran into problems in this step. Yes, the set-screw holds the gear onto the spindle, but years of dried-up grease also prevented the gear from coming out as easily as it should. I had to put some degreaser on the spindle and set-screw to clean the part off well enough. To remove the old hard grease, I find that a car engine degreaser works best, along with an old toothbrush. If engine degreaser is not available, use something like “Fantastic” or “409”. Be sure to eventually wash this cleaning material off with water so that the residue does not weaken the effectiveness of the new grease that will later be applied. Close-up of the governor assembly. 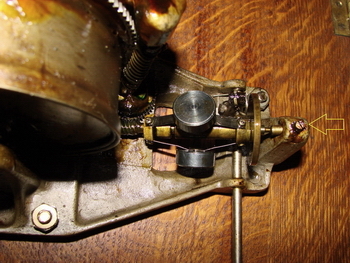 Note how it engages with the brass gear (on left) that is attached to the underside of the spindle. The governor also meshes with the spring-barrel to control the release of its energy. Arrow on right points to the screw that must be removed so as to free the governor. Now, I positioned the entire machine right-side up. To help free up the stuck brass gear, I put both of my hands underneath the turntable platter and pulled up. There is usually some looseness or wiggle room to begin with. Gentle moving up and down on the turntable gradually forced the brass gear-ring to the bottom end of the spindle. It took several rounds of up and down motion, and once the spindle released the brass gear, I was able to pull the whole assembly (turntable and spindle) straight out of the top of the motor board. This was half the battle over. Now that I had the turntable and (rust-frozen) spindle removed as a unit, I could concentrate on finally freeing the two parts from one another. I proceeded to put the spindle/turntable into a vise on my workbench. The turntable has a bulge on its underside (likely there to strengthen the turntable spindle shaft - see photo). This bulge served as a good way of securing the platter in the vise (but tighten only enough to hold it in place. Having it too tight would make it more difficult to remove the spindle). Next, I put an old cloth on top of the point (or top) of the spindle. After a couple of gentle taps the spindle fell through the bottom of the platter. Finally, after decades of being rusted together, these two parts were now free! Mission accomplished. With the spindle removed, the rest of the motor cleaning and greasing should go easy (I hope). But that is a story for another article. I am not a phonograph repair technician, nor do I do this as a business (strictly a hobby, as I’ve always enjoyed fixing and repairing things). My purpose in documenting this procedure was to show our readers how easy it could be for a nontechnical person to tackle what at first glance appears to be a very difficult (or near impossible) repair. If you are not comfortable in performing this, or any other service to a gramophone/phonograph motor, then consult one of the vendors listed in the advertising section of this magazine. But sometimes it’s more rewarding (and cheaper) to do it yourself! Special thanks to Angelo Ruffin for suggesting the technique in the first place. Do you have a technical tip or suggestion you can share? We’d love to hear from you. Write myself or CAPS editor and we’ll assist in putting your tip into print.